They say the Europeans have their fingers on the pulse of fashion. This is, apparently, why the patterns in Burda Magazine often look completely outlandish to me. They are 2-3 years ahead of the provincial little town I live in. Apparently. I remember the first pattern I saw with an exposed zipper. It was in the January, 2009 issue. Yuck, I thought. Nice skirt, except for that stupid zipper. I made the skirt. 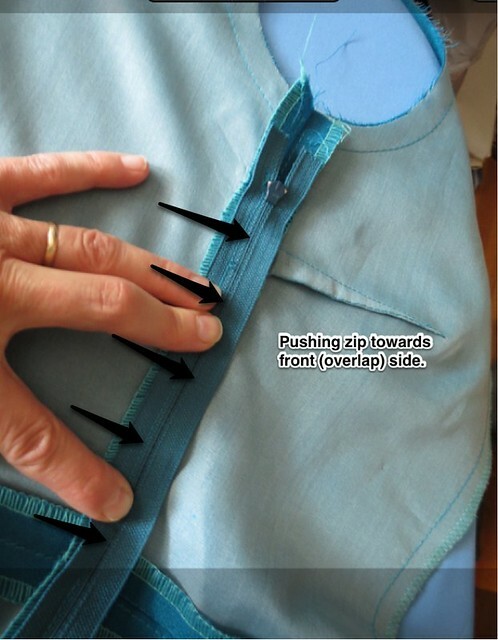 I put a demure invisible zipper in a seam at CB (where a zipper belongs). I resisted the exposed zipper trend until very recently. I do love my LBD with the long metal zip. It took me 39 months to come to terms with this trend. It's probably just about over. So imagine my alarm when I saw this last week. At first I thought the good folks on Ravelry were putting a bunch of amusing 30 year old patterns up for posterity. No. This is a pattern by Bergère de France from their 2012-13 collection. I figure I have until fall, 2015 to stay in denial. FINALLY The Sewing Lawyer finished that dress. You know, that one she's been taunting you by mentioning since FEBRUARY? The one to be made from luscious peacock blue wool crepe, underlined with silk organza and lined with china silk? That was cut out (all layers) in APRIL? 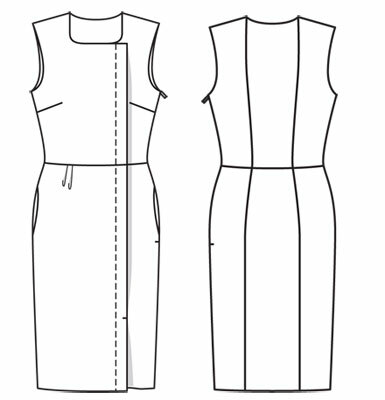 The sleeveless dress with the asymmetrical faux closure and side zipper? Surely you remember it! In case not, here (again) is the line drawing. 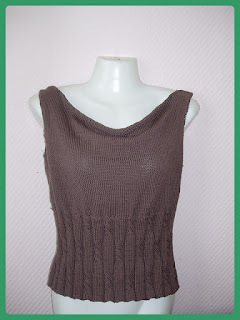 As of March, 2014, the pattern is available for download on the BurdaStyle website. I made a muslin. One thing that needed adjustment was that the bodice was too long. I shortened it by about 1cm. I also realized that despite recent weight (and circumference) reductions, I still needed a bigger size in the hip, and some of the extra needed to be in the front thigh area. I could add a bit to the little tucks, and to the underlap left side front. However, I had a moment of puzzlement as I contemplated that dead straight right side overlap. I outwitted Burda by installing a long dart along the foldline. Once the dart is sewn and the facing is pressed back along the dart line, it is totally invisible. As you can see at right (sort of). Let me see, what else can I tell you? I installed a lapped zipper at the side seam. 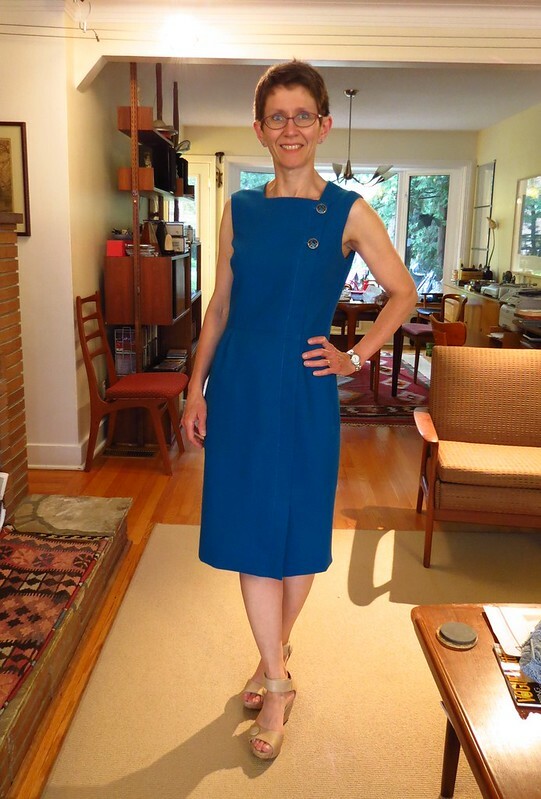 I decided I didn't want the zipper to open right into the armhole, although in retrospect, that would have made climbing in and out of this dress less of a contortionist's worst nightmare. I haven't done a lapped zipper for years. I remembered a trick which involves centering the zipper on the basted seam and sewing one side of it (the underlap side) permanently to the seam allowance only. 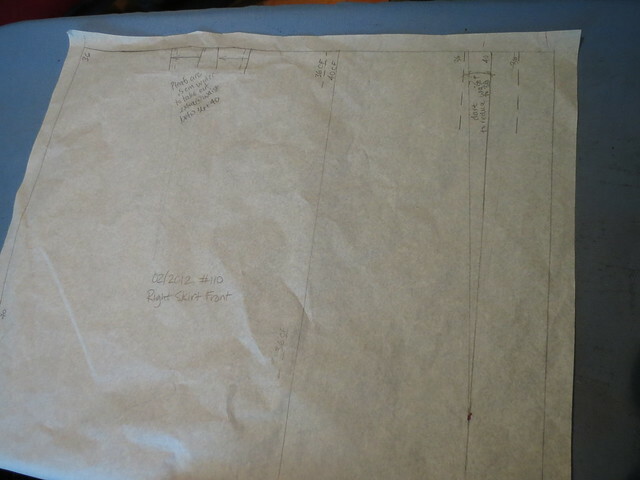 The next step is to pull or push the zipper and seam allowance over towards the overlap side. 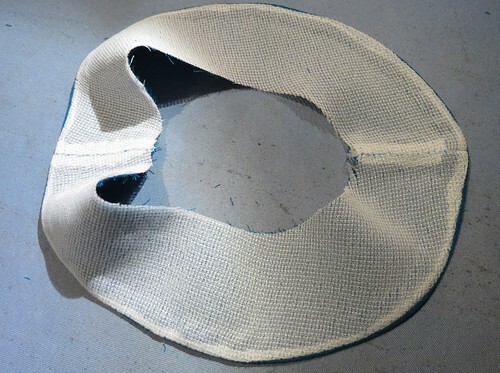 Once it's pressed in place, the third and final step is to sew the overlap side through all layers. Wow, that's unclear! Hoping a picture could be worth a thousand words, here I am pushing the zipper over in preparation for step two. 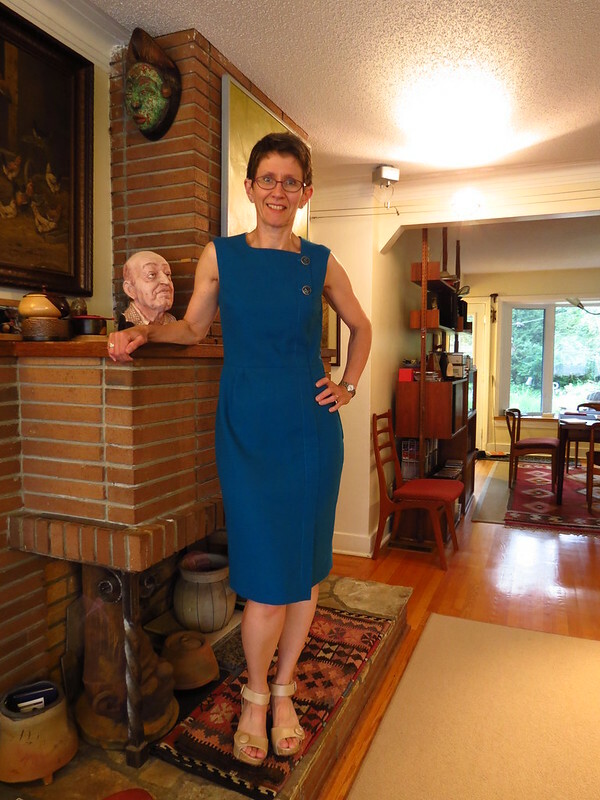 The dress is fully lined with fun china silk (2nd hand find courtesy of my husband) for the bodice, and slippery bemberg for the skirt. What can you tell from this flat on the floor inside-out photo? One: there are facings at the armcyes. It would have been impossible to sew the lining to the edge by machine at both the neck and the arm openings, and handsewing would have been (a) clunky and (b) a nightmare. I puzzled over this and then decided to take DIGS' excellent advice which was to draft a little facing and interface it with a clean finished outer edge. I've done this before. Here's a pic of the interfacing side of the facing. 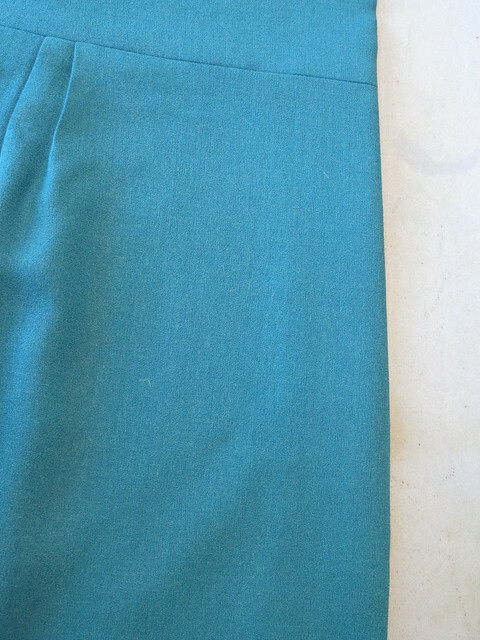 Two: there is a fashion fabric facing at the lower end of the underlap side of the skirt. 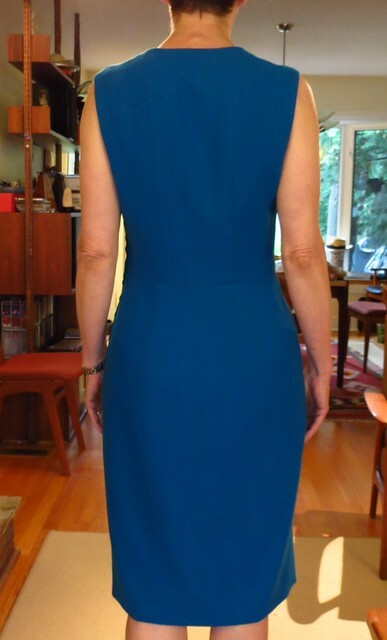 This was a retrofit; according to Burda I should have lined to the edge. A facing is needed for (a) stability and (b) looks, since when I sit down in this narrow skirt the underneath of both sides of the opening would show. Three: the entire faux opening is ATTACHED BY HAND. I truly hope it's sufficiently secure. One of the (many) reasons why this dress is so delayed is that I was puzzling over whether I could possibly sew this by machine. I came to the conclusion that I could not for many technical reasons, and that if I tried it would look like crap and I would just have to rip it out and do it by hand. So I skipped to the end and just did it. 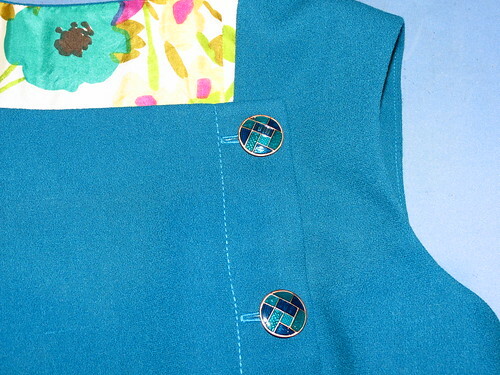 On the outside, the faux overlap is topstitched using ordinary sewing thread and a triple stitch. And I added two functional buttons at the top. They're gorgeous, heavy and expensive enamel buttons which I found at Darrell Thomas Textiles. I think they are absolutely perfect. 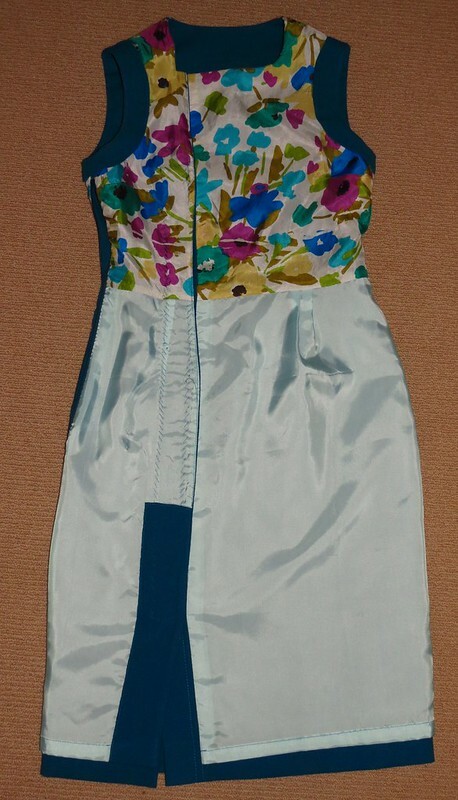 The dress will be modelled tomorrow when there is some light. I need a simple sewing project ... badly! At least I'm finishing something, if not my turquoise wool dress. Here is my latest knitting project, which I think is quite successful. It's made from a blend of 70% silk, 30% linen acquired from ColourMart. The gauge is about 30 stitches to 10cm (4") so there are about a millionty-million stitches in this puppy. It was an adventure from the beginning because I used a pattern available only in French found on Ravelry (it's called Harmony; look it up if you are a member). 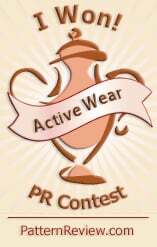 Though it had been on the site for several years, nobody had posted about making it. The first challenge was to translate and understand the pattern. This involved some e-mails with the designer who was very responsive and helpful. The second challenge was to decide if the pattern as written would actually work in my yarn. I decided it wouldn't so I set out to adjust on the fly. The third, of course, was the actual knitting. It took just over six weeks. Things I did differently from the pattern: chose a different fibre with different properties; increased the number of stitches; changed the cabled rib pattern a little bit; knit in the round to eliminate seaming as much as possible; adjusted the shaping to create the cowl; added i-cord binding at the arms to improve the finish. It's a good thing I'm apparently fearless. All that said, it looks quite a lot like the picture on the Ravelry pattern page, so I'm very satisfied.